SPIROPLAN® right-angle servo gearmotors W..CMP.. Precision, dynamics and high speeds: Our small and lightweight SPIROPLAN® right-angle servo gearmotors offer you a strong service profile - specifically for applications in the lower torque range. Space-saving servo drive solutions for your specific requirement profiles. 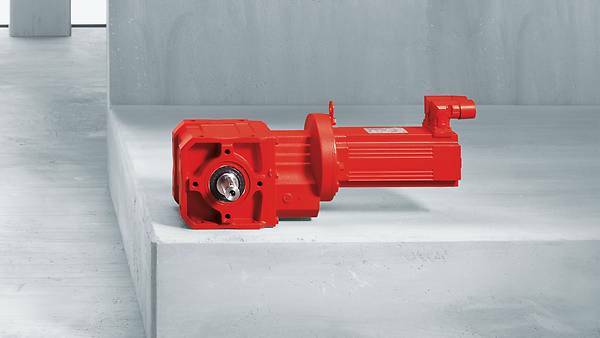 Our SPIROPLAN® right-angle servo gearmotors are an impressive compact solution - small and with an especially low weight. They have been specifically designed to implement top speeds in your systems. In doing so, the lightweights with aluminum housing work precisely and in a highly dynamic manner. Rely on compact design, performance and a range of variants from a single source when planning and implementing your systems. To this end, configuration possibilities from 5 sizes for the SPIROPLAN® gear units and 7 different motor sizes of the CMP.. series are available to you. You can achieve even greater flexibility thanks to the low weight and the wide selection of drive variants. In this regard, the range for your applications includes the design with solid shaft and key as well as the version with hollow shaft and keyway. Both options are also available in the corresponding flange-mounted design. All this makes the SPIROPLAN® right-angle servo gearmotors W..CMP.. an all-rounder for you. Especially when solutions in the lower torque range up to 180 Nm are required. as this small and lightweight servo drive can be accurately scaled and can implement very short response times. as the right-angle gearmotor design can be optimally integrated into any system architecture. as our modular motor system of the CMP series offers 7 different motor sizes. The oil quantity is independent of the mounting position in these sizes.